What Makes This Book So Great is out and you need to get it now. That’s it, review done. ‘But, but’, you say, ‘what if I don’t like reading lit crit? What if I think it’s silly to publish blog posts in paper format?’ Well, keep reading then. I’ll tell you what makes this book so great. First of all, it’s not lit crit. At least not the kind you’re thinking of. As Walton herself says in the book and also in this guest post at Civilian Reader, it’s essentially fan writing, reactions and impressions sans jargon and lots of references to what other critics thought. It’s similar to what I and other book bloggers write. Which brings me to my next point. When blog posts are published in a book, it does result in a loss of that part of blogging where people tell you how wrong you are. But do not despair. What Makes This Book So Great is still full of excellent essays even without the ensuing discussion, and if you really want to say something, Walton advises you to dig up the post in question from the tor.com site and comment away (she still reads the comments!). Now, a couple of caveats. Number one, there are some spoilers strewn about in the book, though Walton is pretty good at telling you where they start. For a lot of books in this collection, the statute of limitations on spoilers has long passed, but you can still avoid them. Number two, Walton recommends reading the posts in order, as some later ones reference the ones before them. I didn’t jump around, although I did skip a few entries altogether. There are chunks of this book devoted primarily to one specific author or series, Bujold’s Vorkosigan Saga being one. Now, if you haven’t read any books in that series, you might not want to read ten or so entries devoted to it. Or maybe you want to read the saga first and then come back to the essays (this was my reason). In that case, read entry #49 (‘Choose again, and change: Louis McMaster Bujold’s Vorkosigan saga’) and then come back later to read the other ones. And if you didn’t want to read these books, #49 will magically make you want to do so. In fact, most of the entries will magically make you want to read the books mentioned. As I mentioned previously, Walton even makes me want to re-read books I know I did not like (and there is an essay that discusses why occasionally you might want to read books you didn’t think were good). What Makes This Book So Great is a journal of re-reading, a compendium of reactions to books read more than once. If re-reading is something utterly alien to you, there are essays about it in the book, and you can also read Walton’s latest post about it on Fantasy Faction. I personally really like re-reading. I blame being a bookseller for the fact that I don’t do it as much anymore. I am overwhelmed with new books on a daily basis, and while I don’t really want to read most of them, what’s left is enough to send me into too-many-books-too-little-time reading despair. Walton reminds me why that this kind of despair is silly (of course you won’t be able to read all the books in the world, so just relax and read what you want) and why it’s usually a great experience coming back to books you loved (but not always!). Apart from posts that make you want to read all the books, Walton also has essays on reading and genre in general. These are probably my favorite, particularly #95, ‘SF reading protocols’. I think she is absolutely spot-on in this one — SF reading is a essentially a skill you acquire by reading SF. Walton is very astute when she talks about what’s going on in the genre, or when she compares it to ‘mainstream’ fiction (see #7, ‘”That’s just scenery”: What do we mean by “mainstream”?’). All her posts are worth reading, even for books you don’t care about. She is that good. And now, go get the book already. Wow! 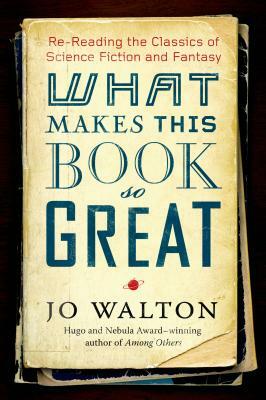 You have me totally convinced to get this book, having only read Among Others, I am all on Jo Walton’s bandwagon. She is my author to read this year. Woot! I do love her writing and her observations on the genre. Okay, you’ve convinced me, too. I was one of those people wondering why I would want to read blog posts… But it does sound really, really cool. You know, I’m embarrassed to admit I’ve never had the pleasure of reading Jo Walton. Something I hope to change later this year with My Real Children! She is great! I recommend Among Others if you like coming of age stories and old sci-fi books :). Never read her books, but I could read something that praises Bujold anytime. Lot of pub about this one, going to go read some of her old posts and see if this could be my thing. All her posts are still available online, so go for it! She also did a great series of posts on Hugo winners, looking at nominees for each year until 2000, I believe. Everything she posts is obviously her opinion, but I enjoy her essays/posts even if I happen to disagree.